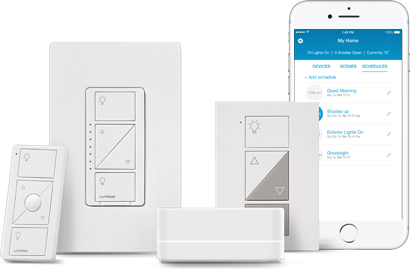 With the choice of both an in-wall dimmer switch kit or an outlet plug in kit, all homeowners will find a Lutron product they will be comfortable with. Both versions come with a ‘Smart Bridge’ that will plug into an open port on your wireless router and pair with them. In addition, the individual remote controls will be paired, giving you the ability to control lights using the remotes from within the home without using your phone if you so choose. Functionality is the same no matter whether you have in-wall switches or outlet plug ins. You can manually pull up each device and turn the brightness fully on or off from the app. Additionally, Lutron gives any light being controlled the ability to have the dimness setting adjusted regardless of whether the light bulbs are dimming bulbs. Whether you want that light on at 50% for enjoying a book by the fire or 25% so that you don’t trip on the way down the hall to bed, Lutron has you covered. There is a built-in scheduling feature which allows you to fully program a schedule for each individual device. An advanced feature allows for you to define “scenes”. Scenes are extremely helpful when you have several lights you wish to perform the same way every time for an event. For example, set yourself an “after-dinner scene” that has all the second floor, dining room, and finished basement lights off, while at the same time the kitchen dims to 50%, the family room lights to 75% for someone to enjoy a TV show, and the living room lights adjust to 100% for finishing homework or checking in on social media. Even in today’s day of energy efficient bulbs, a true additional “energy saver scene” would be to have an all off setting, combatting the family members who are always leaving lights on. Lutron is also a leader in the remote control / wireless window shading system market for an advanced smart home solution. Whether you choose the in-wall dimmer switches, the outlet plug in switches, or some combination of the two, contact your local home technologist Smart Home Solutions for installation! Considering an enhanced system with shades and lights operating in concert? Call in Smart Home Solutions for a Product Feasibility Assessment.